Everybody loves Yahoo, it is a Internet sensation that is known throughout the world. Now there is Yahoo Bingo, like everything else with the Yahoo name, it represents quality assurance. Play bingo with one of the most trusted establishments online. Entering the homepage of Yahoo Bingo opens up a world of gaming that is of extraordinary proportions. Bingo is the name of the game and Yahoo holds nothing back to bring the best online bingo right to your computer. The web page speaks for itself with a simple design yet busy with endless gaming possibilities. Besides bingo there is every type of game with layers of pages that seem to go on forever. Yahoo games are strictly for UK & Ireland players and follow the guideline closely for legal jurisdictions. Players can rest assured that the highest level of security protects their personal data. The Useful Tips found on the main page is an informative overview of games and how they work. Helpful tips are explained to give players that winning edge. Games are powered by St Minver software for an amazing package of bingo products. The software is a leading contender in the European online gaming market. Yahoo Bingo is licensed in Gibraltar. It is bingo at its best with two of the most famed bingo variations around, 90 ball and 75 ball bingo. Each variation has a selection of bingo rooms both offering some of the biggest Progressive Jackpots in online bingo. The Bingo Time Table is a list of schedule games including Breakfast BOGOF, Special Jackpot games, 2p games, Lunch Bingo, Night Owl Games and more. The selection of Slots is huge and the Progressive Jackpots are massive. Spin the slots with coins values that start at 1p per line. Each slot offers descriptive information before playing for full understanding of the machines. Choose between a selection of Scratch Cards and match three symbols for big cash prizes. Casino Games are impressive with some old favorites and some games that may be new to players. Blackjack, Roulette, Snapjax and Moneywheel are part of the casino games to choose from. Arcade Games complete Yahoo Bingo with tabs that will launch you to a whole world of other gaming options. Upon registration new players will receive a free £1Welcome Bonus. Though this does seem a bit small and may not seem worth your while, it does give players ten bingo cards free in the 10p room. It only takes one card to bingo and win big. A handsome No Deposit Bonus for all new players is offered upon making their first deposit transaction. Yahoo Bingo is much more generous on this bonus and winning will be easier than ever with these bonus boost to your bankroll. The Promotions page is bursting with all kinds of offers. Check for the monthly surprises they have in store for you. Special offers may include Free Bingo, Cash Match, Happy Hour and more. Bingo Loyalty Points are a great way to earn bonus money. Simply play Bingo, Blackjack and Slot games and you will earn valuable points on every wager. Bingo earns the most points with 10 points for every £1 spent. The name alone is one every player can trust. Besides bingo there is large venue of games to choose from. We rate Yahoo Bingo with an impeccable 5 Pink Hearts. Is there anything they forgot to offer at Yahoo Bingo? I see so much going on it makes me want to jump in and start playing because I *know* I can win something here. They've got Spiderman, Monopoly and other really fabulous looking slots games to play. They have suduko. They have skills games. They have bingo, of course. Instant win. Lottery. Web games. And probably a whole lot more that I have yet to discover. 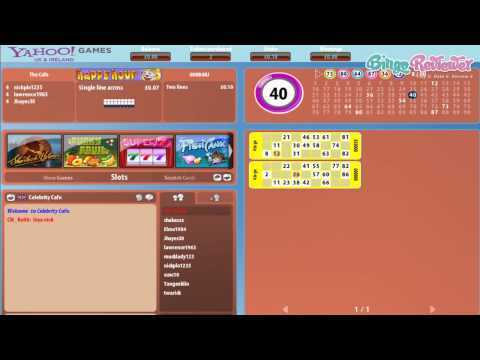 You can play bingo live and win big with your chat master hosts and their fun games. You can win PJPs. You can call BINGO! You could be a lucky monthly winner and have your picture and story featured for all the world to see. The possiblities seem endless at Yahoo Bingo. For 2013, they have a promotion going on to Get Fit. They are giving away fitness prizes and this is a good excuse to play bingo, my friends. Who can blame you for wanting to get in shape this way! Yahoo bingo looks to be tons of fun so I hope that forum members are joining in and taking advantage of all the entertainment being offered at this site. The welcome offer here was not bad. As a new player, you will receive £1, plus 10 free bingo games and there is absolutely no deposit required. Now, I was much more interested in the games of course, as opposed to the free £1. However, as an additional bonus to the 10 games, it’s not a bad deal at all and I was very pleased. The free games gave me a chance to see exactly how their games run and whether or not I was going to really like the site. That was a few months ago and today, I am still enjoying everything that they have to offer. They have three variations of bingo here, which includes 75, 80 and 90 ball. I found this to be a great selection along with the wide variety of other games they have to offer. In particular, I love their slot section as well which is equipped with many 1p slots! Yahoo may not be having a time of its life, but the games department still works nice. The site is built on a St Minver platform, and I must say it is a name I haven't heard that often. Quick note, they have a huge list of available games, not only Bingo (which is the main reason I tried the site), but also the slots, Sudoku, lottery and a few others. You will get four rooms in total, with 75, 80 and 90 ball games, and it's a pity they don't have the fast going 30 ball bingo. Anyway, there are a ton of chat games, and it's a nice way of winning even more. You get a great starting promotion, 10 free games of bingo, and on the top of that, another £1 just to get you going. If you like to try different games before making deposits.